New Horizons Honors Gary Montgomery and Judy Vanpuyvelde with Gala Award for 26 Years of Service! After nearly 3 decades, Gary Montgomery and Judy Vanpuyvelde still find joy in volunteering with New Horizons clients. The year was 1991 when Gary Montgomery first met New Horizons’ Golden Nuggets, a junior bowling league made up of clients whose mission was to meet every Saturday from 9am to 11am at Bowlerland and bowl. Enthused by the opportunity just to be a part of this special band of bowlers, at the time Gary could not have imagined that more than 26 years later he would not only still be bowling with them, he would also be running the league. Gary’s long extended volunteer assignment came when he was “temporarily” asked by New Horizons to take charge of the league until a permanent person could be found. The goal was to make sure the organizations’ clients could continue to partake in the weekly event which they loved. Gary’s commitment to them grew, and in 1994 he introduced Judy Vanpuyvelde to the Saturday morning league. As their relationship blossomed, Gary continued to invite Judy to help at the bowling alley. For all those years Judy has been by Gary’s side, selflessly volunteering her time as well; and together they, now husband and wife, have become a very important and consistent part of the clients who bowl lives. Gary and Judy’s experience in working with individuals with intellectual and developmental disabilities led to Gary being chosen to officiate the bowling at the 1999 Special Olympics World Games in North Carolina. In 2010 he responded to the Los Angeles City Parks budget cuts by taking over its Special Needs League, now called “Corbin Angeles.” From 2014 to 2017 he also became a competition manager for the Southern California Special Olympics Bowling. And Gary and Judy were both a part of the 2015 Special Olympics World Games held in Los Angeles for an incredible 10 days! For all they do to promote inclusion for those with disabilities and especially our clients, New Horizons is honored to present this very special couple with the agency’s Dignity, Love and Compassion Award! 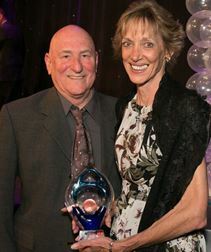 Gary and Judy, recipients of the 2018 Dignity, Love and Compassion Award.